Canister vacuums can be very useful for keeping your hard floors clean. Miele is well-regarded for their canister vacuums, and the now-retired Miele S6 Quartz was one of their mid-level options. It has since been replaced by the Miele C2 Quartz, which looks nearly identical. This review is about the S6 Quartz (S6270), but can be extrapolated to the new C2 Quartz. Many different features on this machine make it a wonderful canister vacuum for hard surfaces, but it doesn't do a great job on carpeting. Miele produces excellent machines, and this vacuum is no exception. It is a durable and versatile bagged canister vacuum. Read on below for our video review, followed by our in-depth review detailing all we found about the Miele Quartz vacuum. 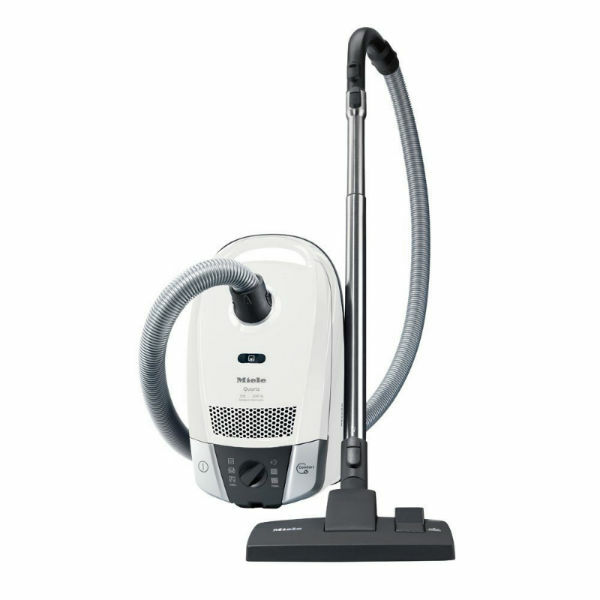 The Miele S6270 Quartz canister vacuum is a very sleek and shiny little machine. All the dust that is sucked up will be out of sight, as this is a bagged machine. There is a dustbag change indicator on the top of the canister, so you will know without having to open the top of the Miele Quartz if you need to change the bag. 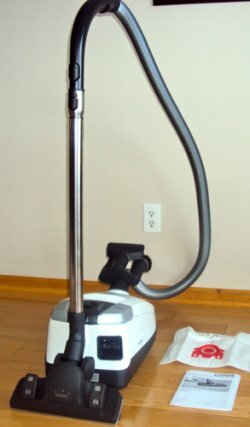 We loved this vacuum for cleaning hard floors like tile or hardwoods, but we didn’t like it for cleaning carpets or rugs. The main reason for this level of performance was because the Miele S6 Quartz doesn’t have a rotating brush bar. The floor brush that it comes with is very good at cleaning hard surfaces, but it doesn’t clean well in all situations on carpeting. 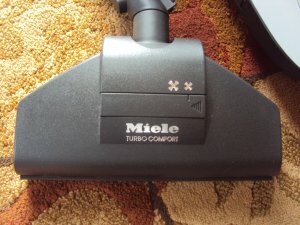 If you are looking for a vacuum that does well on carpets, you will have to purchase the turbo brush for an additional cost, or choose a different Miele S6 model. This is by far the strength of the Miele Quartz. We ran a series of tests and it performed well in every aspect when cleaning up a hard surface. 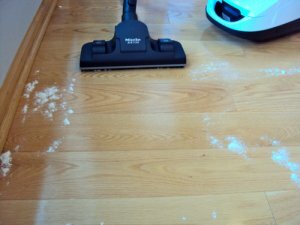 First, for smaller particles, the Quartz sucked up all the flour we dumped on the hardwood flooring. The 11-inch wide floor brush glided right over the debris and sucked all of it up with ease. This mess was cleaned up with only one pass. When we used larger particles to test the Miele S6, it did a good job. The suction was incredibly powerful as it sucked up a large amount of debris immediately. There was one thing that was a bit concerning. The teeth on the bottom of the floor brush don’t have a lot of open space between each section of bristles. For a larger item like a pretzel or a large piece of cracker, it will get pushed across the floor instead of sucked up. Debris that is 1/4 of an inch wide or larger won’t fit between these teeth. You will have to use a different on board tool for very large debris. We were very impressed with the carpet cleaning capabilities of the Miele S6 with the turbo brush attachment. It cleaned up small particles and large particles easily on short pile carpeting. It also did a good job cleaning up to the edge of the carpet. 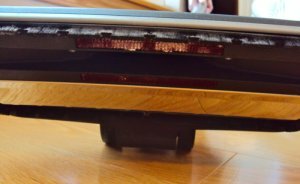 The 11 inch wide cleaning path does better from the side than it does head on when you are trying to clean the edge of the carpet by a wall. It doesn’t work as effectively on longer pile carpeting because the brush is non-electric. The suction power of the vacuum turns the brush bar, so long pile carpeting will slow down the brush bar. On an area rug that we tested on, there are small sections that have a little higher carpet level, and you could notice the difference in speed and power when we cleaned a higher pile carpet compared to short pile carpeting. 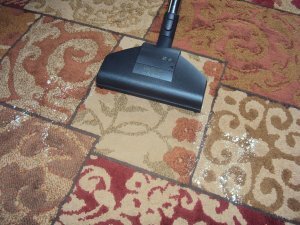 The suction can be adjusted to help you clean different levels of carpet, but the clearance is so low, that anything larger than fine particles will get pushed instead of cleaned up. Also, the floor brush doesn’t glide across the floor easily when you have the suction set to carpeting. 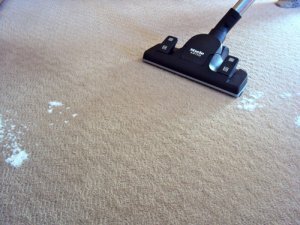 You need to set the suction on high for a carpet because dust and dirt gets lodge into the carpet fibers. With a higher suction level selected on the Miele S6, the floor brush really grabs and clamps down on the carpet, making it difficult to push or pull across the floor. It did do a good job cleaning up the flour we dumped onto the short pile carpeting. With only one pass, the flour was cleaned up immediately. It did take a little too much effort though to get the floor brush to go back and forth across the floor. As for larger particles, the floor brush attachment is not really need since these particles stay on top of carpets. You can just vacuum them with a different attachment – as the floor brush will not be effective. Once again, to clean up a rug effectively, you need powerful suction and a rotation brush bar. The Turbo Brush was excellent for cleaning rugs. The floor brush wasn’t effective on the rugs. The floor brush tends to clamp down on the rug and lift it off the floor instead of gliding over it. You can turn the suction down to alleviate this lifting up problem, but then you won’t be getting the rug as clean as it should be. For hard floors, the Miele S6 did a very good job. With only one pass going either head on or from the side, the edge of a hard surfaced floor will be clean. 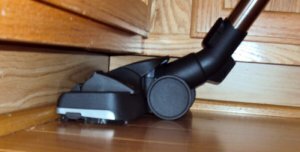 The floor brush also is relatively low, so it can fit under the overhang of cabinets with ease. It also can slide underneath furniture to get these areas cleaned up. The turbo brush for carpeting did an excellent job cleaning up the edge of the carpet. Go from the side, though and not head on. The floor brush didn’t get all the way into the edge. When we dumped flour on the carpet, there was a very small amount left on the carpet where it met up with the molding. It was also difficult to push the Miele floor brush up against the edge of the carpet. In addition to the floor brush, there are three tools that sit on the VarioClip. The VarioClip, as Miele calls it, sits at the base of the canister’s hose. There is the upholstery brush for dusting off hard surfaces like a desk or getting curtains clean. The second tool is a stair brush, which worked very nicely on the stairs. The third and final tool is the standard crevice tool for getting into the tight corners. All the tools slide on and off the stainless steel telescopic wand nicely. We also enjoyed the adjustable height settings on the telescopic wand. It has a very long reach at up to 10 feet from the base of the canister’s hose to the tip of the on board tool. The S6 Quartz doesn’t have an airtight filtration system, but it is pretty close. With our laser particle scanner, we tested how much dust was emitted out of the exhaust. There was actually less dust in the air than there was coming out of the Miele S6 Quartz. The Miele S6 is very easy to use and maintain. 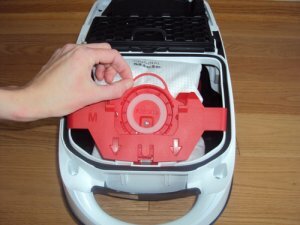 Even though it is a bagged machine, changing the bag is also very easy to do and not messy at all. It rolls around on the ground smoothly, and has the very enjoyable one touch cord rewind system. No tools are necessary to set up your Miele canister vacuum. It comes in a rather small box with the hose and telescopic wand detached. All you have to do is snap in the vacuum bag, attach the hose, wand and cleaning tool of your choice, pull out the cord, plug it in, and get cleaning. This is top notch for moving around. There are three 360-degree swivel castor wheels on the bottom of the canister. As you clean, you don’t even notice that your vacuum is gliding across the floor following you like a little friend. The hose coupled with the 20 foot cord gives you a cleaning radius of up to 33 feet. This allows you to clean more than one room at times without having to change outlets. The design of this canister vacuum is ideal for cleaning stairs. It sits nicely on a step as you clean. 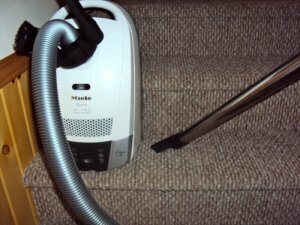 The stair brush and crevice tool both are great options for getting your stair case completely clean. 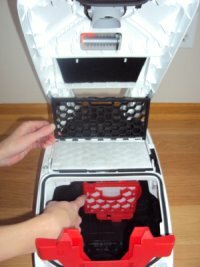 Also, because the Miele S6 canister is very light at about 10 pounds, it is easy to pick up and move to the next step as you clean. With it’s six different suction power settings, the noise level will vary. At its most powerful setting, the decibel meter registered about 75 decibels. This is still quieter than the average vacuum. If you dial it down to the lowest suction power, it is around 60 decibels. This is extremely quiet for a vacuum. The FilterBag change indicator will be completely red when the dustbag is full. The AirClean FilterBags have a self-sealing collar. We can’t begin to mention how nice this is. When you pull on the red tab to detach the bag, no dust will escape. To load the new bag, you simply slide the red tabs until they snap into place and you are ready to go. 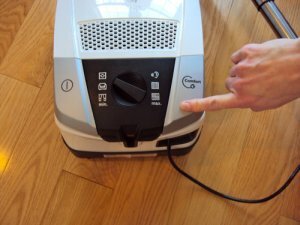 There are two different filters that you have to change on the Miele S6 vacuum not counting the bag itself. Both of these filters are accessed very easily after you open up the canister’s lid. The AirClean Filter, and pre-motor filter are all disposable. There is no washing out filters. The AirClean Filter located on the top of the unit should be changed once a year. The pre-motor filter should be changed every five bags. A new pre-motor filter will come with a box of five Miele vacuum bags. Miele produces very high quality products that last for a very long time. The value in purchasing a vacuum like this is in how long it will last. Miele vacuums are built to last past 1000 operating hours. The cord rewind is also designed to handle over 1000 pulls and retractions without any incident. In a typical household, it would take you over 15 years to reach 1000 hours of usage with your Miele vacuum. 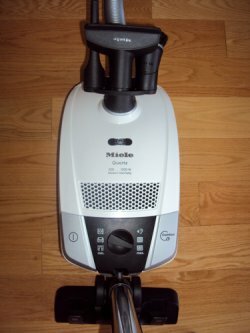 The price for a Miele S6 Quartz is between $400 and $500, but Miele has a reputation for very long-lasting vacuums. The Miele S6 Quartz model without the optional turbo brush is a perfect cleaning tool for hard flooring. The Quartz models was designed for hard flooring and occasional vacuuming of low pile carpeting – so it’s not a good choice for carpeted homes. To clean carpeted flooring effectively, you can purchase the turbo brush to make it effective in all cleaning situations. Another item to consider is that there are recurring costs with a bagged machine. The vacuum itself will last you for a very long time, so you won’t have to buy a new one any time soon. There are recurring costs with new bags and filters but that’s a price you need to pay for a perfect filtration system and clean air in your home.